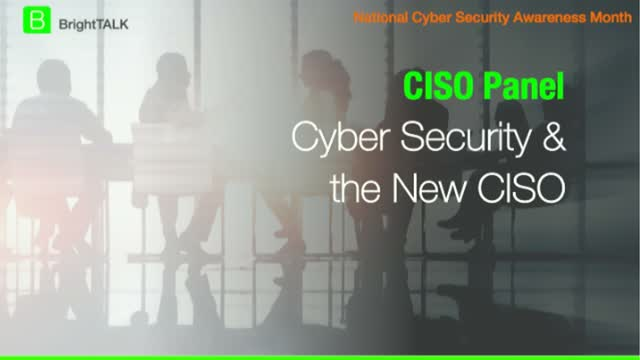 This webinar is part of BrightTALK's coverage of the 15th National Cyber Security Awareness Month (NCSAM). As more corporate data moves to the cloud, the new challenge is to efficiently manage security in both the cloud and on premises. How are organizations coping and what are the solutions they should be employing? This keynote panel is part of Cloud Month on BrightTALK. In this session, you will learn 37 tips on how to maximize all of your experience to satisfy and even shorten the five-year CISSP experience requirement. You will also learn how simply passing the exam and becoming a CISSP Associate can fast-track your cyber career. Plus, you can learn more about our offer for free CISSP exam insurance during Cybersecurity Awareness Month. This webcast is part of National Cyber Security Awareness Month (NCSAM) on BrightTALK. - What skills and education do you see as essential to success? It is critically important to know how cyber criminals target their victims, what you can do to reduce the risk and make it more challenging for the attackers who steal your information, your identity or your money. This session explains how outside attackers or malicious insiders can exploit vulnerabilities using examples such as a compromised email account password that escalates into a full-blown breach of network security and how a light bulb almost stopped Christmas from happening. Discover the basic cyber hygiene practices your organization should have in place to drastically reduce your risk exposure. Join BrightTALK and partners as we celebrate the 15th Anniversary of NCSAM in October 2018 with a series of CISO panels, webinar presentations and video tutorials.